• Want to start a mobile DJ business? 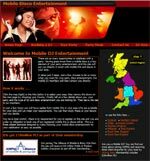 • Already run a mobile disco & looking for business advice? and more - just click the links below. Our DJ Tips have moved to a new home! We're launching our new Free DJ Digest - Practical Advice and Information for DJs - sign up now - it's free! Some ideas to gain extra work as a mobile DJ and book some mid-week dates too. Issue 69 - November 2014 - Why Not Me? How do you respond to client enquiries? We provide some tips to help you. Improve your events, increase your referrals, make more money! Issue 61 - January 2014 - Are You a Proper DJ? Our 2013 Christmas Competition with 19 super prizes to give away! Issue 50 - Jan 2013 - PLI - Why Bother? Exclusive! We reveal the latest details regarding the Pro Mobile Conference 2013. Over £1,000 worth of DJ related equipment to give away! Our latest give-away - with prizes worth over £500! Apr is the start of the new tax year so we tackle this awful subject! Issue 38 - Jan 2012 - How Does a Client Choose? Plagiarism and copyright are covered in detail - what can you do? Issue 23 - Oct 2010 - Does Your Service Have Unique Value? Issue 21 - Aug 2010 - Advertising or Marketing your Business? Issue 20 - Jul 2010 - How Accessible Are You? Just how easy is it for a potential client to get in touch? Where do you start? How much should you charge? Have we found the Christmas spirit too early? Issue 9 - Nov 2009 - How Effective is Your Business Card? Issue 8 - Nov 2009 - What do Clients think of Your Site? How hard do you make it for a client to book you? 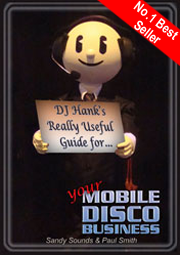 Click the image above for a free peek at DJ Hank's book. Available on Amazon for the Kindle and in paperback from the AMPdj Store.